Even landlocked dive virgins can appreciate the beauty of the scuba world, whether through gorgeous underwater stills, or the sweet guitar hook on "Aqualung". 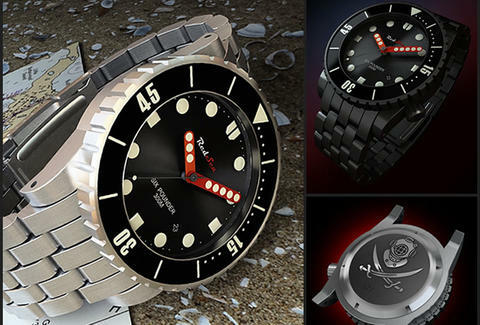 Making dope dive pieces that anyone can rock: Red Sea Watches. From a pair of Mpls desk jockeys inspired by tales of pirates (who apparently dress nicely), RSW produces high-end, (relatively) low-priced dive watches that're fashionably chunky, utterly durable, and made in limited-edition batches of only 75 per model, even further reducing the chance that someone else is biting your style at the shipwreck...other than that shark. Their first-ever drop includes two looks: The Six Pounder (pirate slang for cannon) and The Holystone (sandstone formerly used to scrub ships' decks), which differ only in the patterns adorning their red hands; both boast a 316L steel case that's water-resistant to 300 meters, a 120-click timing bezel, uber-reliable Miyota 9015 automatic movement, and luminescent hands by Lum-Tec, not to be confused with failed Amish startup Loom-Tech. The wrist-accoutrement comes with three bands (rubber, four-loop nylon, and 5-link stainless steel) and face/dial in your choice of stainless steel or SWAT-style jet black, which's coated on via Physical Vapor Deposition (PVD), also what Space Ghost gives in front of the court after capturing the bad guy. Each watch also comes with a zippered travel case, and an underside engraved with an old-fashioned diving helmet atop crossed sabers, so handsome that, just like an inexperienced dive or first-time viewing of Jethro Tull's tights, it may well leave you breathless.